Introducing our New Junior Learn to Play Program! 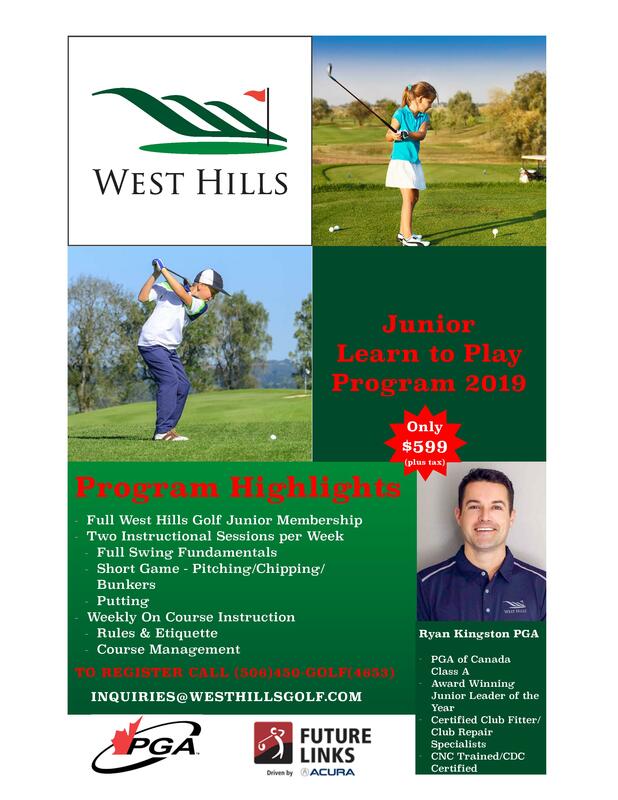 We are pleased to announce that PGA Professional Ryan Kingston will be heading up our New Junior Learn to Play Program at West Hills Golf. Please give us a call at 450-GOLF (4653) or email us at inquiries@westhillsgolf.com for further information. Looking for a Gift Card for that special golfer on your holiday list??!! Due to the snow accumulation/low temperatures we have decided to close our golf course today for the season. Our superintendent/crew will be using the remaining good weather days to properly winterize the golf course. On Monday October 29th, I will be providing an update on our seasonal hours of operation, 2019 Membership Rates and when you can purchase them. Our clubhouse sale starts today and will continue into next week. Due to the weather forecast this week and into Saturday, we have decided to close the golf course on Friday October 26th (weather permitting) for the season. Power cart usage for the remainder of the week will based on the daily weather. Our driving range is now closed for the season. Online booking after today will be disabled for the season, so please call the clubhouse at 450-4653 for any info you may require. Due to the forecast and cold temperature today, we will be shutting down at 1pm. 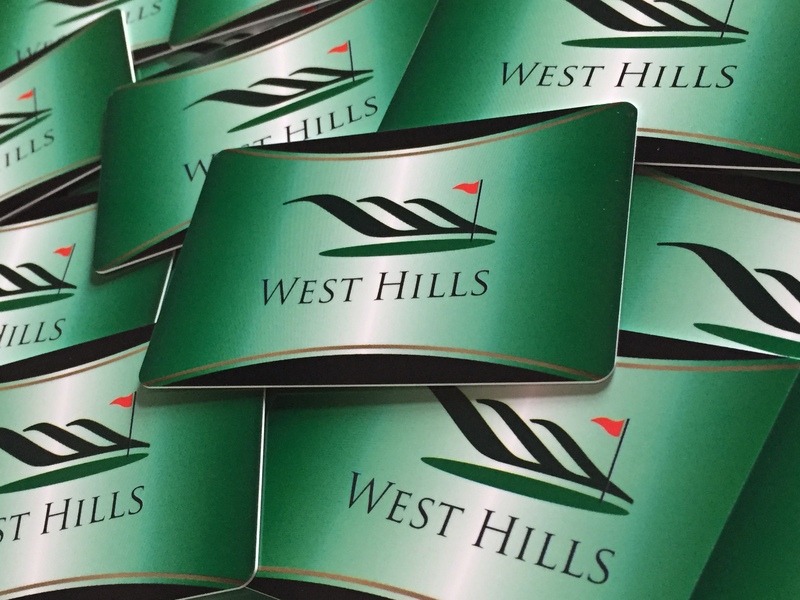 West Hills Golf News Update Wednesday, September 24, 2018. As a necessary part of our cultural program at WHG, our fall aeration program for the greens will begin on Monday, October 1st. Our plan is to close and aerate the front 9 on Monday and reverse the process for the back 9 on Tuesday. As you are aware, the weather plays an important role in this process, as we need a sunny dry day to complete these tasks. We plan to start on October 1st, but will postpone if conditions are not adequate and begin again on the 2nd. As always, we appreciate your understanding during this process. As the weather/daylight hours change in October, I wanted to update/remind everyone that our 1st tee time of the day will start at 8:00am as of Monday, October 1st. The risk of frost is now starting to affect our start times in the morning, so we would ask all golfers that usually book first thing in the morning to start to book a little later in the day to ensure that their reservation is not cancelled. Currently, our last tee time of the day for 18 holes is set at 3:20pm, while our last tee time of the day for 9 holes is set at 5:20pm (Last 18 hole round = 3:00pm, Last 9 hole round = 5:00pm as of October 1st). –Wednesday, September 19 (12pm to close – back 9 will be available after 12pm, with only 16-18 Power Carts available to book for that day/time period). –Thursday, September 20 (2:00pm to close – Power Cart restriction. Course must be cleared by 2pm. Back 9 only can be booked for walkers after 3pm – 4-5 Power Carts available). –Friday, September 21 (2:30pm to close – with only 16-18 Power Carts available to book for that day/time period). Also, please mark on your calendar, that our fall course maintenance is scheduled to start on Monday October, 1st – details to follow shortly. As the weather/daylight hours start to change in September and October, I wanted to update/remind everyone that our 1st tee time of the day will start at 7:30am as of Monday September 10th. As most of you are aware, the risk of frost will start to affect our start times in the near future, so we would ask all golfers that usually book first thing in the morning to start to book a little later in the day to ensure that their reservation is not cancelled. Currently, our last tee time of the day for 18 holes is set at 4pm, while our last tee time of the day for 9 holes is set at 6pm (these times will be changing as the days get shorter). Super twilight rates will now start at 3pm effective Saturday September 8th. Also, I wanted to mention that our beverage cart availability will also be changing based on the weather/daylight hours. Please remember that if our beverage cart isn’t out, please don’t hesitate to call the clubhouse and we can run something out to you with our starter or staff member when time permits. A small number of dates with tee time/cart restrictions will be updated shortly, so please check your messages or our “Bulletin Board” on our website for the latest course information. I wanted to let everyone know that for Thursday, August 30th, power carts will be partially restricted due to a private event (9 holes) that begins at 2pm. I wanted to take a quick moment and thank all of our members who participated in our 1st ever Club Championships this past weekend. Great weather and just a great bunch of people! With regards to the trophy presentation, my original option for our CC trophies ended up not to the standard we were satisfied with, so I decided to go with a local company “Club Fred Grafx” to supply us with our trophies. I had the new versions on display over the weekend and should have them finished up shortly. When completed, a formal group photo/time will be set at everyone’s convenience. Special thanks again to all of my staff members in both operations and maintenance for their hard work to get the course ready and to make this event happen!